The Craziest Star Wars: Episode VII Rumor Yet! Is Disney going to destroy the integrity of Star Wars after all? That's what a ludicrous new rumor claims. Also, a surprising Avenger could be showing up in Guardians of the Galaxy. 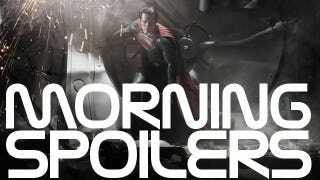 Zack Snyder has some hints about the tone of Man of Steel. Guillermo del Toro's vampire TV show could start filming pretty soon. Plus brand new posters for The Host and Warm Bodies, and your first pictures of Thor in Thor 2. We've got a few more directors backing away in casually non-committed way from the project. "I have very little to say about it. Certainly, no specifics about whats going on behind the scenes in the selection of that person [a director]. I think that I can speak as a Star Wars fan, which is important to me. Whoever does do this movie, I think, just needs to have a fundamental understanding of why it's important to us. We come from a generation who grew up with this as children, to us it's almost a belief system. It's harder for people who are older or who were already teenagers when the movie came out to understand how deeply it is our mythology. You know, I saw it on the Internet, but I haven't approached them, they haven't formally approached me. I mean, I heard some rumblings, but to me it's really - I have so many projects to discuss or think about. [For] something that is not a possibility yet, I don't do that. You know, because I have so many things that I need to catch up with. If this becomes ever a reality, and there's an approach to do it, I would then think about it, but - it's like thinking if I want to date a supermodel. I don't think about these things. Get out your salt shakers, because you're going to need all the grains of salt for this next rumor: Disney wants to bring Darth Vader back. The U.K. tabloid, The Express, quotes an industry source as saying, "He's an integral part of the franchise. Replacing him is virtually impossible. The plan is for him to return and play a significant role in the new films." "It's a more serious version of Superman. It's not like a heart attack. We took the mythology seriously. We take him as a character seriously. I believe the movie would appeal to anyone. I think that you're going to see a Superman you've never seen before. We approached it as though no other films had been made. He also gushed about Superman's place in superhero mythology. He's the king-daddy. Honestly that's why I wanted to do it. I'm interested in Superman because he's the father of all superheroes. He's this amazing ambassador for all superheroes. What was it about him that cracked the code that made pop culture embrace this other mythology? What we‘ve made as a film not only examines that but is also an amazing adventure story. It's been an honor to work on. As a comic book fan, Superman is like the Rosetta Stone of all superheroes. For a non-gamer, I'm a big fan of the AC games, but I'm personally having trouble believing that the multiple timeline / DNA memory / Chariot-of-the-Gods-esque plot / historically Catholic organization is evil / Muslims are good / liberal all the way back around to libertarian worldview of the games could ever be a movie. Even after they cast Michael Fassbender, I didn't believe it. I am also wrong, since Ubisoft's chief marketing officer has now said, "we have the movie in the coming year." ex-con/ex-cop Travis Chase [who] is dragged into a battle for the future that revolves around an amazing artifact. Finn finally tracks down his real father, only to discover that he's close to death. As he tries to build a relationship with him, Finn realises that his newly discovered half-sister might know more about their father's illness than she's letting on. Finn continues his sleuthing in an attempt to win Jess's affection by discovering Alex's hidden secret. MTV interviewed Guillermo Del Toro about his upcoming adaptation of his book into an FX television show. The pilot has been green-lit and filming will begin in August, after Pacific Rim premieres. In the fall we'll know if FX plans to pick up the series for its 2014 schedule. It's real but it feels a little stylized. But the way the camera work will be is very realistic. We want to keep the camera very documentary even if the look of the show is not. The look of the show is very designed. The style of the camera and the storytelling will be very loose. It will evolve from that feel of reality, and little by little we want to evolve into more stylish, horror feel that requires smoother camera moves, more suspense and atmosphere-driven moments so it will be a mixture. Here's a sneak peek for episode 1x06, "Legacies." Cora and Hook face off with Mary Margaret and Emma in a race to secure the compass, which will point its holder to the portal into Storybrooke. But back on the other side, Regina and Mr. Gold, desperate to keep Cora out, put a plan into action that would kill anyone entering the portal – placing Mary Margaret's and Emma's lives in danger as well. Meanwhile, back in the fairytale land that was, Captain Hook travels to Wonderland and meets up with a vengeful Queen of Hearts. Here's the sneak peek for episode 3x06, "Hounded." Additional reporting by Rob H. Dawson and Charlie Jane Anders.